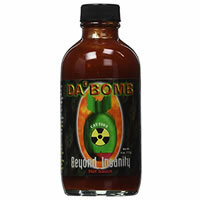 Da’ Bomb Beyond Insanity Hot Sauce is an EXTREMELY HOT sauce; I mean INSANELY HOT! I see where the name comes from because this sauce has an INTENSE BURN, definitely the hottest sauce I have ever tried. It’s difficult to taste much of the flavor outside of the Habanero Pepper pain. I mean you could taste a little of the chipotle flavor, but the burn quickly overpowers any flavor. This thick sauce is dark red, thick, and filled with little chunks. I have to admit that the spice level is WAY outside of my tolerance, but it’s a must try for anyone willing to take the risk. Overall, this sauce is not for the weak; try it with caution because the burn is “beyond insanity”. This sauce is dark red, thick, with little chunks. Da’ Bomb Beyond Insanity Hot Sauce smells like habanero pepper and chipotle. It has a major spiciness to the scent; it’s definitely a warning to your taste buds. I would have to rank this as more than EXTREMELY HOT. Allow me to confirm that the Habanero Peppers definitely make this sauce VERY SPICY with a major burn that lasts….and lasts. It’s too spicy for my taste, but if that’s what you are looking for, then this is the perfect sauce. Beware, and try with caution. At first, I could taste the unique chipotle flavor, but in seconds, my mouth was too busy embracing the SPICINESS to really taste any of the other ingredients in the sauce. This sauce is SO HOT that I suggest trying a very small amount before you dive all the way in. The burn is intense and it lasts a long time. This sauce has more ingredients than I was expecting. The most important ingredient is the Habanero Peppers. 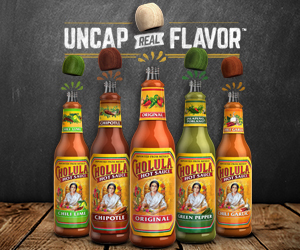 They are clearly responsible for the burn and spicy flavor, while the rest of the ingredients are hard to taste because of the strong burning flavor. However, it also has Chipotle Puree which consists of Chipotles, Water, Salt, and Citric Acid. You could totally taste the chipotle flavor before the insane burn kicked in. The most unique ingredient is the Orange Juice Concentrate; I haven’t seen that as an ingredient in any of the other hot sauces I have tried. I couldn’t even finish the small bite of chicken I cooked in a TINY bit of the sauce. For those of you who are adventurous spicy food lovers, this sauce is worth trying. For me, it is WAY outside of my spice tolerance. The 4 oz bottle costs $10.14. That’s one of the pricier hot sauces I have tried so far, but still it’s not bad considering a little sauce goes a long way. I couldn’t find a guarantee on this product.